Even though modern circulating coins are no longer made of silver, you can still purchase these 90% silver Walking Liberty half dollars, which circulated throughout the country for years. 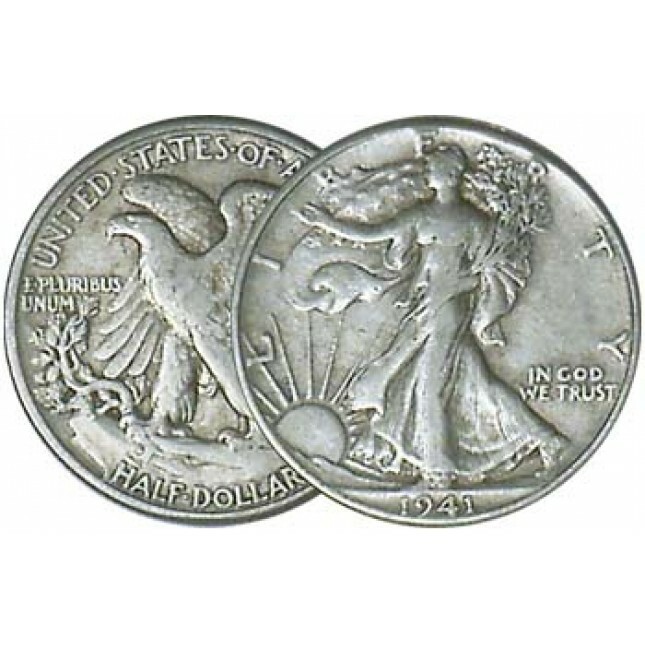 Silver half dollars were common in pocket change until the 1960s, when wise collectors picked them out of circulation and the US Mint eliminated silver from American coinage. They are still prized by both collectors and investors. Legal tender coinage produced by the US Mint from 1916-1947. 90% silver half dollars are a commonly traded and widely recognized investment product. However, circulated 90% silver coins are still traded as an investment product around the world. These coins are sometimes referred to as “junk silver” because they are in circulated condition, but make no mistake: they are a wise investment, indeed. If you put away a paper $10 bill in 1965, you’d still have $10; but a roll of pre-1965 Walking Liberty half dollars is now worth many, many times that! Half dollars are a convenient way to own silver. Each coin contains a little over one-third ounces of pure silver. Should silver ever be used as a means of barter or become part of everyday commerce once again, these half dollars will be common and widely-accepted. Additionally, they are a special part of American numismatic history, as these beautiful coin designs have not been seen in everyday life for over a half century. 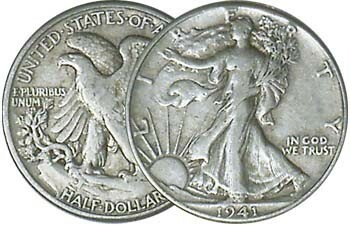 The design of these Walking Liberty half dollars was produced by Adolph Weiman in 1916. The dime and quarter were also redesigned this year, but the Walking Liberty design of the half dollar is widely considered to be one of the most beautiful in the history of numismatics. Though the design was replaced by the Franklin half dollar in 1948, it was revived in 1986 for the US Mint’s new one-ounce silver bullion coin, the American Silver Eagle. Best Prices on 90% Silver!